You've combed through a million portfolios, you've pinned your favourite images...you feel a newborn session is in your future. Now what? Newborn photographers are all very different, and every one of us approaches a photography session in a very unique way. I created this article as a reference about what to expect during a newborn photography session, my approach and my philosophy! With all the variables of pregnancy and childbirth, I want you to feel calm, relaxed and well-informed before picture day. The whole postpartum transition is a wonderful, beautiful + warm & fuzzy blur...so my aim is to make the session as relaxing and easy as possible for you! 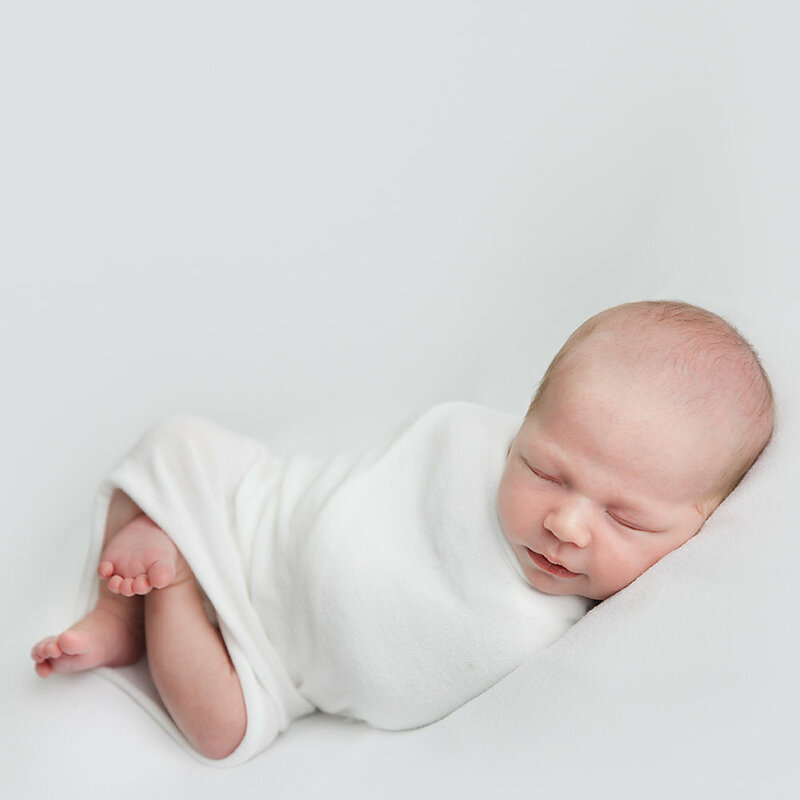 #1 - What is a newborn photography session? #2 When should I book my newborn session? It's recommended that you pre-book your newborn session while pregnant. I limit the number of newborn sessions I take per month because of the unpredictable nature of due dates. To book, a $100 retainer is paid to reserve your spot on my calendar. The retainer is applied towards your chosen session package. When you're home from the hospital (or about 3 days after your baby is born) you'll email me to schedule your session date and time. Newborn sessions are scheduled for when your baby is between 5-15 days of age. #3 What do I need to know before my newborn session? The studio is VERY warm! I keep the camera room a piping 28°C so that your baby will be cozy and sleep well during the session. I recommend that parents dress in layers so that you don't get too hot. I have a client area available if you'd like to take a break, grab a drink and cool off. All sessions begin at 10:30am on weekdays. The sessions last about 3 hours to provide lots of time for your baby to eat. I take a "baby-led" approach to my sessions & because new babies tend to eat frequently, I leave lots of time so that the session is not rushed. I have a nursing pillow available and a fridge for milk or formula. Demand feeding is encouraged so that your baby has a full tummy. I recommend not planning other appointments the day of your newborn session. For your convenience, I do my best to take family and sibling photos at the beginning of the photography session. I recommend arranging for Dad or a relative to take older siblings out for a special fun activity as the studio can be a very boring environment for toddlers. We have two parks near the studio and are a 5 minute walk from the South Shore of Pittock Conservation Area. Dress your baby in a sleeper with buttons or a zipper that DOES NOT go over the head. This is so that I can undress your baby without waking him or her if she's asleep when you arrive for the session. If you're nursing, some believe that certain foods can upset baby's stomach. I have found that coffee can have that effect and recommend avoiding caffeine 24 hours before your session if possible. #4 Why don't you use props during your sessions? Your baby is perfect the way he is. Cute hats, costumes or backdrops got NOTHING on your baby! His little lashes...tiny toes...perfect little fingers and the wrinkles in his skin. My approach is to capture this new little person just as they came into the world. Pure + Simple! (not to mention classic and timeless so you can enjoy the images for years to come). #5 When will my photos be ready? After your session, I'll carefully retouch and prepare your gallery for your private viewing appointment. I'll reach out to you approximately 2-3 weeks after your photography session to set up a time for you to to view your images at my studio for the first time! We'll design your album and choose your favourite images to take home that day. All your printed products will be shipped directly to your home after your order has been placed. #6 How do I book a session? If you'd like to learn more about booking a session, feel free to set up a time to tour the studio! You can email me here, or give me a call, here: (519) 290-2330. I hope to hear from you!